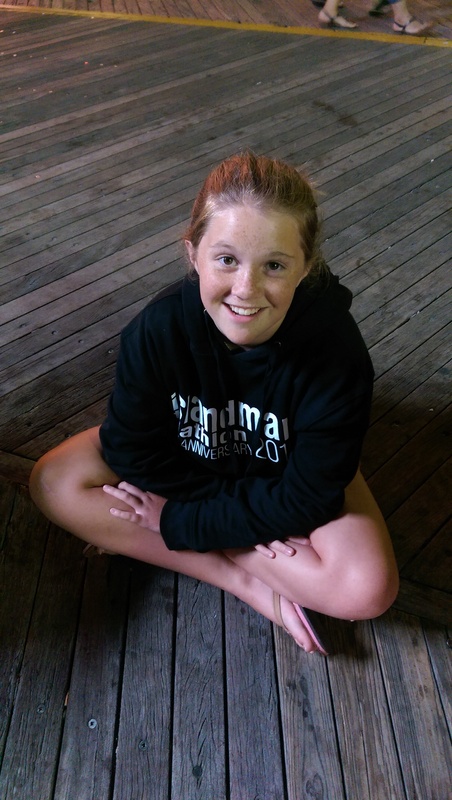 Teenager #2. This one is not so sassy. 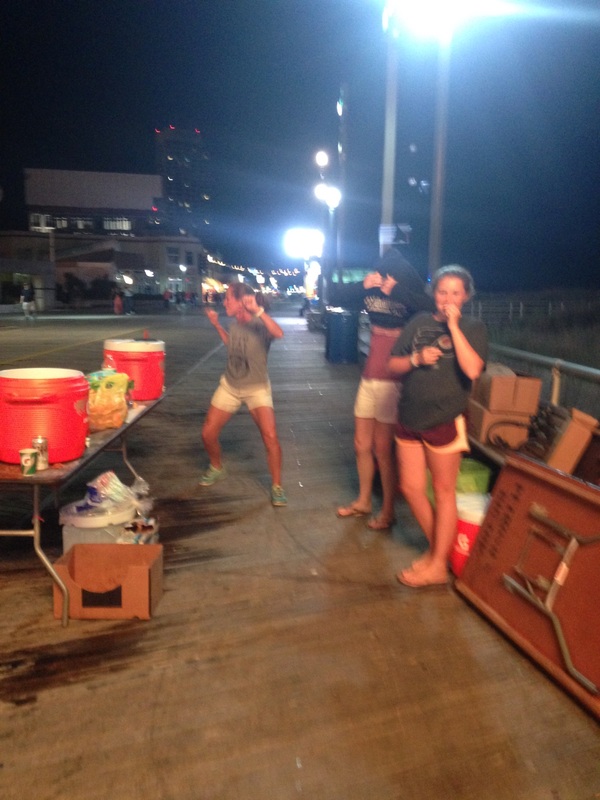 Snarky G, my daughter Kelly and I manned the water stop on the boardwalk from about 5:30pm until nearly midnight. Our stop was conveniently located in front of Bally’s Casino, which was great because their bathrooms are clean and their slots are loose. There was also a Johnny Rockets across from us, perfect for late night burgers and milkshakes. 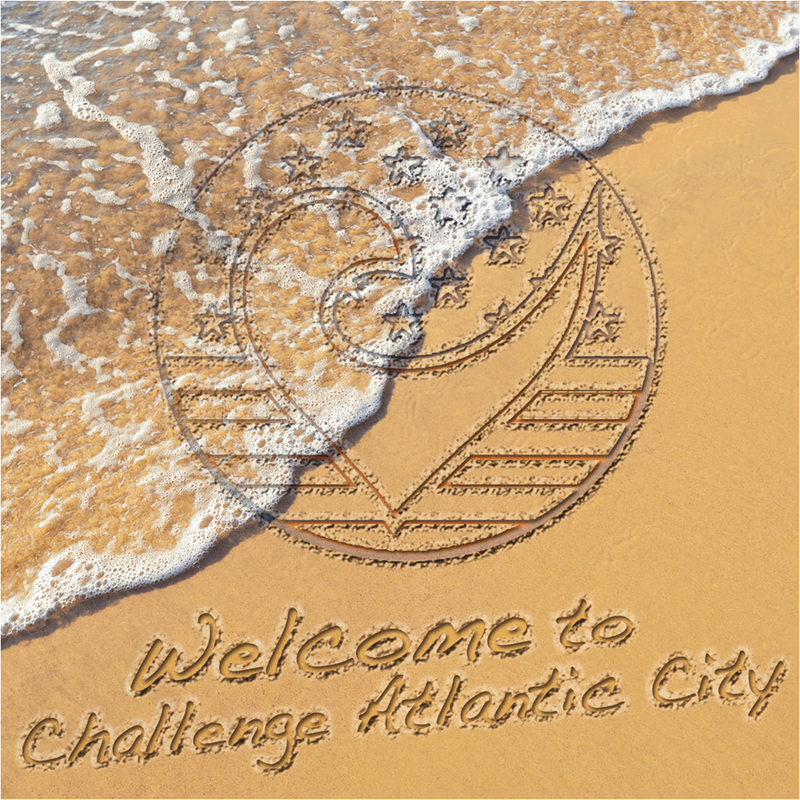 This was my second year volunteering at Challenge AC on the boardwalk. Last year, I was a maniac with a whistle, keeping the run course mostly free of oblivious tourists and belligerent drunks. You can read all about that adventure by clicking here. The courage. We saw so many people who were truly struggling. 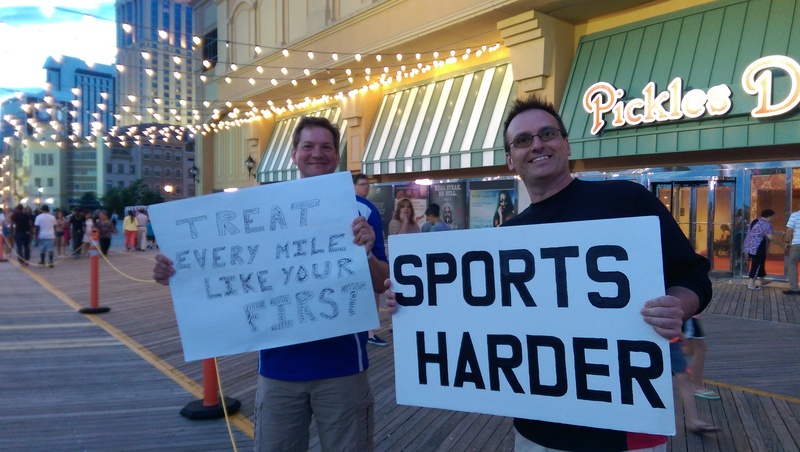 We met runners with severe back pain, runners who were cramping horribly, runners who couldn’t keep anything down. Nobody stopped. Nobody quit. Your courage was inspirational. The music. Our station was directly in front of Bally’s Beach Bar. While the sun was up, we listened to the musical stylings of Philbilly, a band I highly recommend for your next wedding or reunion. Once the sun went down, things started to heat up with DJ Delmo playing all my favorite dance tunes. No, I’m just kidding. It wasn’t Delmo. But that would have been impressive, right? The challenge. Once again, keeping the race course clear for runners proved to be a task and a half. I had huge help from friends and family members of the athletes. One drunk dude, who was of smaller stature, was walking down the middle of the roped-off course. I asked him to move. Then I told him to move. While still on his cell phone, he turned to me and said, “You don’t tell me to move.” Just then, a 6’3″ race spectator came to my rescue and said, “How about I tell you to f**king move now!” He moved. Whoever you are, thank you and I love you more than Spiderman. Two of my “course management” assistants. Thanks, guys! The race director. If you are reading this and you’ve ever raced a Delmo event, you know the Steve del Monte cares deeply about your race day experience. Steve and his most lovely and talented wife Jamie worked with us for the last dozen or so runners. 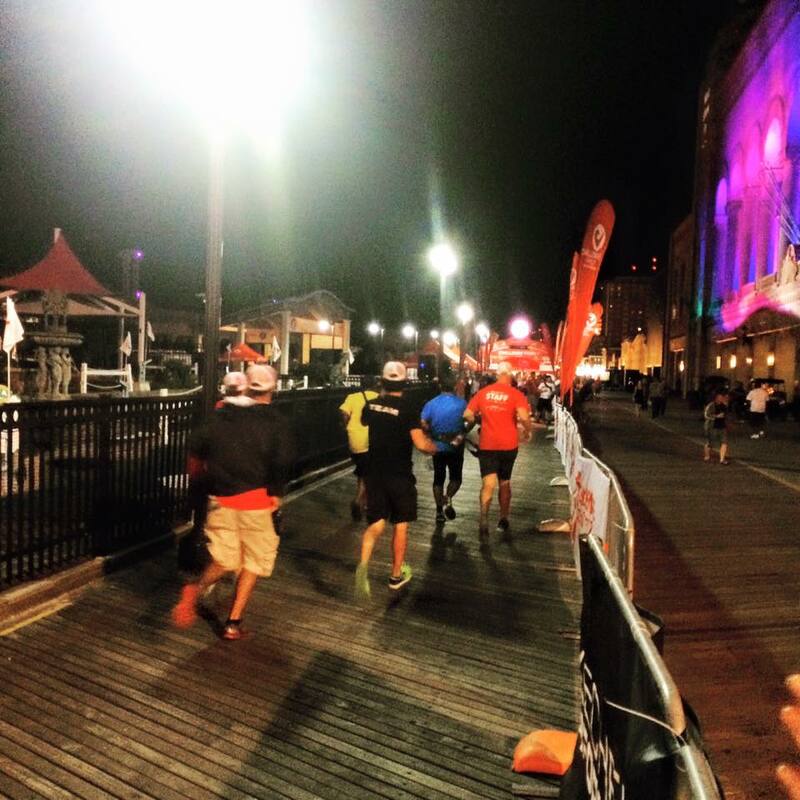 When the final runner came through, he and Jamie ran the last mile with him, in the dark at 11:45pm. I wonder if Andrew Messick does that at Kona? HA HA HA HA HA. Oh man, that’s rich. I totally crack myself up. Congratulations to everyone who showed up that day. I know some people didn’t finish. But I think the victory is achieved at the start. The victory is in the training, the sacrifice, the hours in the pool and on the trainer and running in the dark and the cold before the sun comes up. The victory is in having the courage to commit to such a monumental undertaking, knowing that you still have to pay the bills and drive the kids to school. And if you decide to commit again next year, I’ll see you on the A.C. Boardwalk. I’ll be the one with the sweet dance moves. Laura, you and your daughter are the perfect people to be there at the end for athletes, because you are so incredibly supportive of people and genuinely appreciate what it takes to get through such a challenging event. You, my friend, are the one person I would want at the end if I were to ever take on the Challenge. If my schedule allows, I hope to volunteer at the event next year. This was a beautifully inspiring post. Just keep doing what you’re doing. I love reading your blog!